Gone are the days when sunscreen used to come in toothpaste-like squeeze tubes. 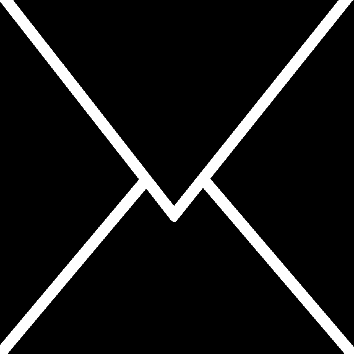 Regular sunscreen tend to be white in colour and leave the same white cast on the skin. Also, they're usually very hard to apply cos they're so tacky ugh. 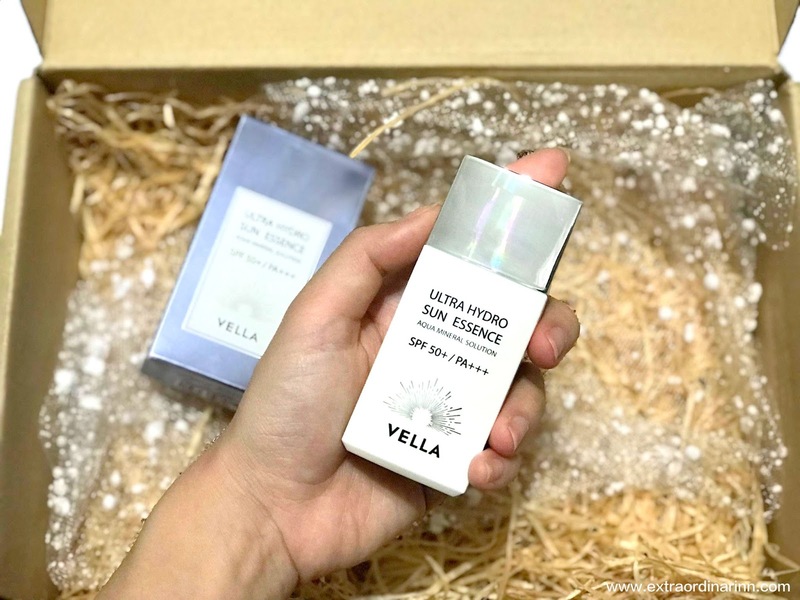 Enter the Vella Cosmetics Ultra Hydro Sun Essence SPF 50/PA+++, which has an aqua mineral solution - it can almost be dubbed as the 'modern' sunscreen for UV protection, whitening and anti-aging. 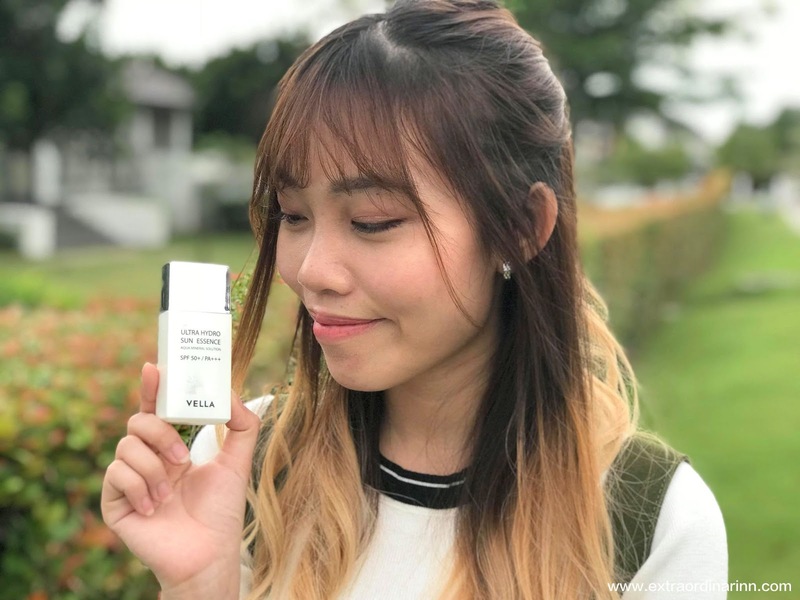 Vella Cosmetics Ultra Hydro Sun Essence is made with 30 marine plant extracts, 45 plant extracts and Hawaii Kona deep ocean water with 61% moisture that lasts up to 72 hours. There are absolutely no paraben, mineral oil, articifial pigments, benzophenone, talc, benzyl alcohol nor sulfate in the product, so it is clinically-proven to be safe and non-aggravating for your skin. The rectangular bottle comes with a rectangular twist cap that pops right off when you want to use it. My minor OCD does kick in tho when I see the clean, shiny cap stained with my fingerprints, so I tend to wipe it off once I'm done using HAHAH ANYONE ELSE LIKE THIS TOO.. PLEASE TELL ME I'M NOT WEIRD 🙈 The product boasts an "Innovative sun feature x Skin all-in-one basic care". I like the tagline "From Suncare to Skincare", because this sunscreen is so lightweight that it feels like you are basically just using skincare. The most unique feature of the Vella Cosmetics Ultra Hydro Sun Essence is that it turns into a watery essence upon contact with the skin! 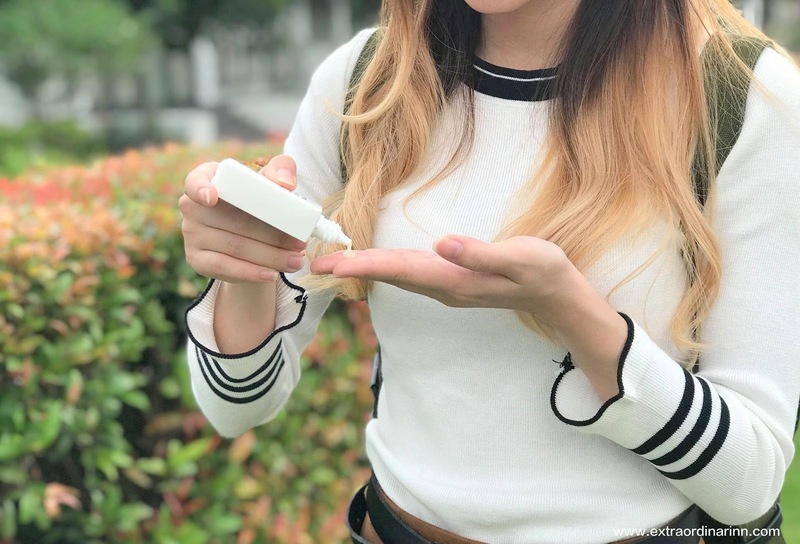 First, the product dispenses as an off-white/ milky yellow liquid and upon rubbing it into your skin, it coats the skin with cooling water droplets. My skin is constantly dehydrated, so something so hydrating is a saviour. 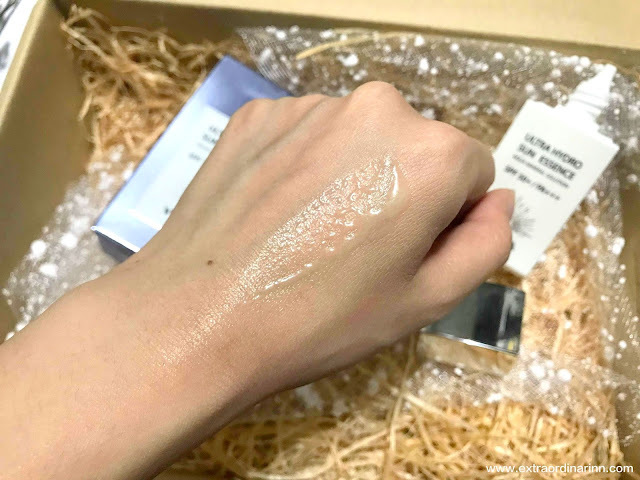 As you can probably tell, this product will not leave oiliness, stickiness or tackiness unlike a lot of the sunblock out there, which makes it the perfect companion to go beneath your makeup. It can also give off a slight dewyness for that Korean glass-skin effect! No wonder they call it a "Sun Essence". I personally like how small and convenient the travel-sized bottle itself is, look how it fits perfectly in the palm of my hand! 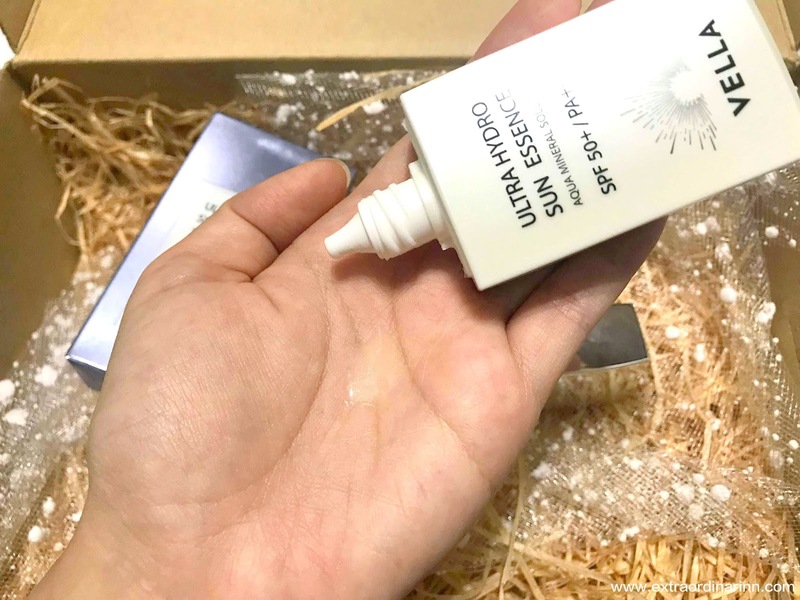 I feel like the product is good to use on top of makeup too if you need a touch-up throughout the day, as its so light and gentle that your makeup won't budge too. However, this sunscreen does have a very strong sunblock-like scent to it (it does not state in the product description that artificial fragrance was not added). So, for those who are sensitive to artificial fragrance or simply can't stant the smell, you might want to avoid this product. I guess the word to use to describe this sun essence would be REFRESHING. 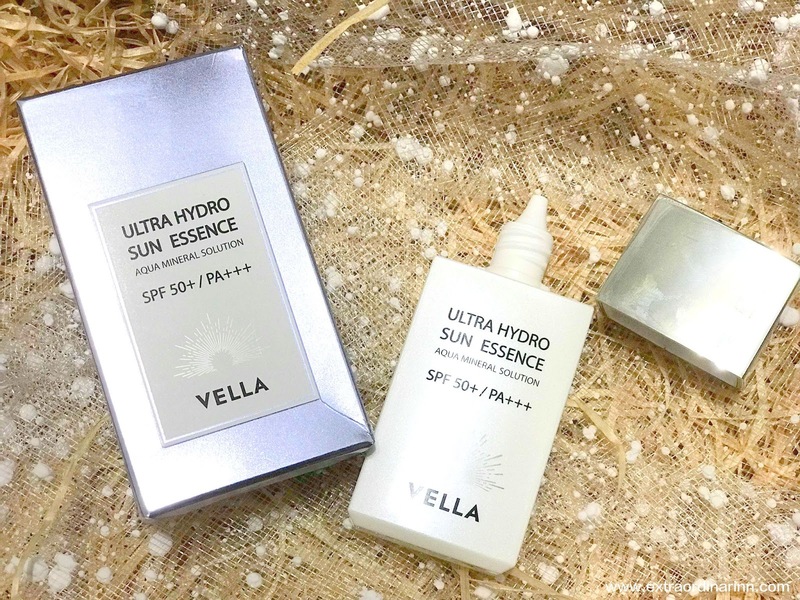 I find that the Vella Cosmetics Ultra Hydro Sun Essence is just so cooling and wakes you right up in the morning. I do find that the product is a tad bit pricey tho, it's about RM58 for 30ml? Um, I would not repurchase at full price, but if watery kinda sunscreen is your thing, then go for it! 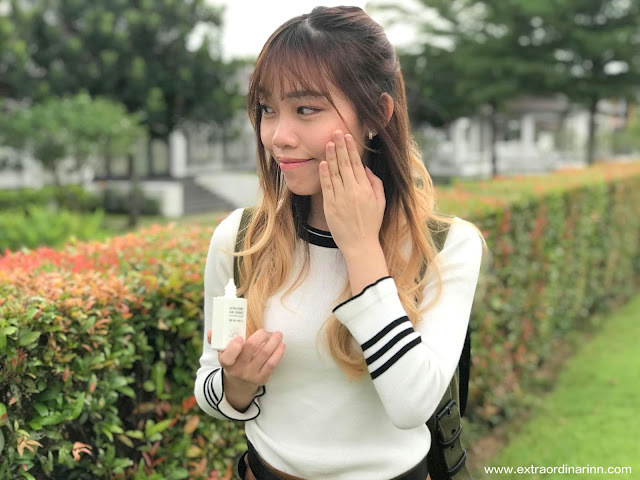 All in all, this product is not mind-blowingly good, but it is still something that I would recommend to use on a daily basis because it can be worn alone, or with makeup for healthy-looking, hydrated skin. 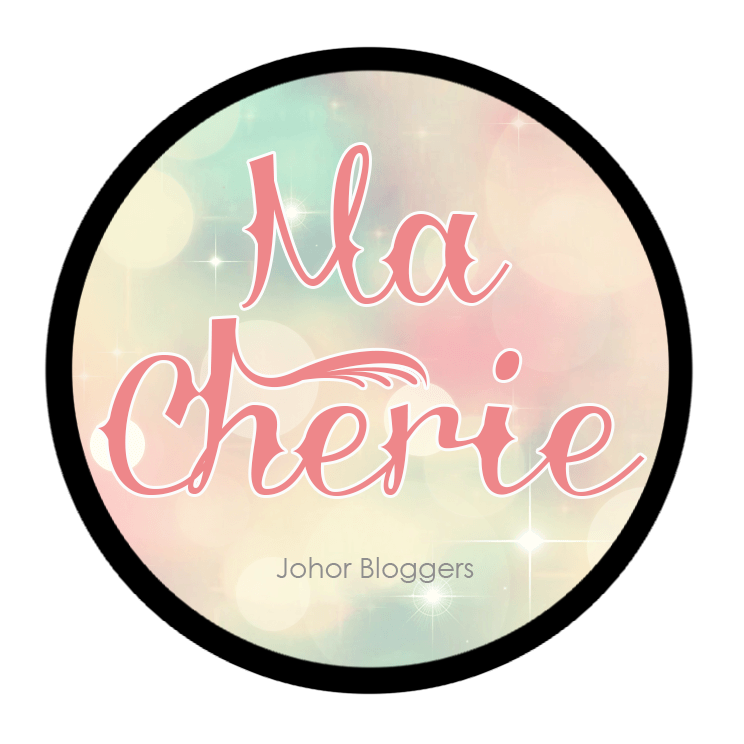 Disclaimer: Even though the review was sponsored, it has not affected my opinion in anyway. All opinions on the product are purely my own after trying it out personally.